The Regional Connectivity Scheme is poised to make a significant difference in India, enabling more people, in currently ‘remote’ locations, to have access to air links at an affordable price. This initiative by the Government has energised the nation and is a major development for people mobility, country infrastructure and aviation in India. However, if we are looking to improve air connectivity as a whole, we should also not overlook the existing markets that are currently underserved. Going from Point A to B requires air travellers in India to make an often lengthy transit through Point C. Such markets have existing passengers who would immediately benefit from improved connectivity, leading to further demand stimulation and growth. People will always prefer direct connectivity and it also allows the airlines to maximise yield by offering a better network. The Regional Connectivity Scheme (RCS) that was recently rolled out is the Government’s push to increase connectivity in India particularly targeting underserved and unserved airports, while promoting the use of smaller aircraft, of up to 80 seats, to do so. We applaud this initiative that will make air links accessible to more people when airlines in India take up the challenge. We also understand, however, the hesitation that airlines have on the RCS, as the capped airfares may not always make economic sense. In this article, we offer an additional avenue for airlines to pursue, which will improve connectivity for travellers, and enable airlines to grow their operations whilst in turn fulfilling the Government’s desire to enhance travel for all. When we look at existing airports with existing air links, we see that much more can be done to enhance connectivity and frequency in secondary and tertiary cities. Based on IATA data, underserved markets have substantial passenger demand for direct (no stopover) and for more scheduled services. Leveraging the existing infrastructure at these airports allows airlines to further introduce new routes between cities that currently require transit to get there or cities that have a low number of scheduled flight frequency (typically less than a daily frequency flight). 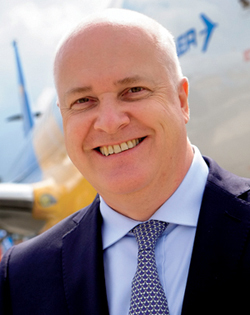 The introduction of a direct flight benefits not only the passenger by reducing total travel time, but also enables the airline to realise improved yields, in some cases up to 15%, on such routes. This is of course the classic Blue Ocean, Red Ocean concept where opportunity lies in underdeveloped or untapped markets. One example of such a market is Chennai-Dharamshala, where the current way to travel between those two cities is via a 10 hour stopover at Delhi; travelling from Hyderabad to Amritsar via a three and a half hour stopover at Mumbai is another of the many examples. By 2020, India will have more than 120 underserved markets in domestic India. With an average stage length of more than 1000km, these routes will be better served by 80 to 130 seater jets. One might ask, if such an obvious opportunity exists, what is holding back airlines from seizing this opportunity? The type of ‘tool’ matters. The current fleet profile of the Indian aviation market is heavily focused on narrowbody aircraft such as the Airbus A320 family and Boeing B737 family that have a seat capacity of 140 seats and above. On the other end of the capacity spectrum, three of the four largest airlines have turboprop aircraft (ATR-72 and Dash-8), which have a seat capacity limited to 80 seats and below where the product is largely only viable for sectors with less than 500 km. In between this spectrum, there are only a handful of 80 to 130 seat jet aircraft (CRJ-700 in Air India and E190 at Air Costa), and this represents an untapped opportunity. Based on Embraer’s studies, two-thirds of underserved markets within India are too thin in passenger demand for narrowbody aircraft operations and more than 80% of these markets have stage lengths too long for viable turboprop operations. It is forecast that by 2020, there will be more than 120 underserved markets with an average stage length of more than 1000km. These markets are more optimally served by 80 to 130 seat jets offering the ideal capacity size for thin passenger demand and with the adequate range capabilities. We have seen multiple ‘success stories’ across the globe, showing how airlines have used E-Jets to stimulate traffic in secondary and tertiary cities. In China, for example, Tianjin Airlines have been operating their fleet of E190s to develop routes to and from cities like Tianjin, Xi‘an, Urumqi (west China) and Hohhot (northern China). Japan Airlines’ subsidiary J-Air uses E190s and E170s to right-size capacity in order to maximise frequency on routes or complement larger gauge aircraft at off-peak times to enhance market connectivity. 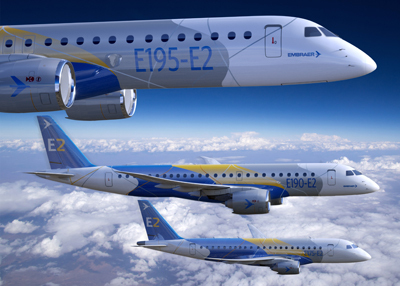 What benefits do Embraer’s 80 to 130 seat E-Jets offer? Due to the low yield environment in India, it is important that airlines generate revenue streams away from passenger fares – ancillary cabin services being one source, but even more importantly, cargo revenue. Unlike other aircraft, whether turboprop or jet, in the 80 to 130 seat category, the E-Jets can accommodate more cargo volume and weight, typically offering up to two tonnes capacity on top of checked baggage. This is a substantial revenue stream. Although current ATR-72 and Dash-8 aircraft fill the segment of an 80 seat aircraft, the aircraft range is a limitation to their effectiveness in delivering increased connectivity. In contrast, Embraer E-Jets offer a range that covers India end-to-end. From an economic standpoint, with an average network stage length of 550 km, and a utilisation of 11.7 block hours per day per aircraft, the Cost per Available Seat Kilometer (CASK) of a 100-seat Embraer E190 aircraft can be 12% to 15% lower than that of an ATR-72 which has levies on fuel price VAT. The second generation of E-Jets, the E-Jets E2, designed to provide better fuel economy, will offer even greater cost advantage through the all-new Pratt & Whitney Geared Turbofan engine and a reduction in direct maintenance costs. This cost advantage that the E-Jet and E-Jet E2 family can deliver will bring about lower fares for travellers and higher profits for airlines, making the entire aviation ecosystem a healthier and more sustainable environment. As aviators say: an aircraft can only make money when it is flying. Being a jet-powered aircraft, the E-Jets can fly faster and their typical high service reliability enables them to fly with higher frequency and more sectors than the turboprop or other 80 to 130 seat aircraft. Fuji Dream Airlines, an all E-Jet operator in Japan recently achieved a 12-month service reliability average of 99.83% - the highest among all E170 and E175 operators. On top of that, E-Jets have less maintenance down time than other aircraft types. E-Jets have longer intervals between Heavy Checks as the aircraft does not have a calendar limit on Heavy Checks, unlike the B737, CRJ and the Dash-8 turboprop that has a 36-month limit. The A320 and ATR turboprop are even shorter with a 24-month limit between Heavy Checks. Furthermore, coupled with the E-Jet superior Flight Hour (FH) limits for Heavy Checks, assuming a typical annual utilisation of 2000FH, the E-Jets require only two Heavy Checks as compared to three to five Heavy Checks for the other aircraft types in a 10-year period. The result is lower maintenance costs for E-Jets with less down time and Heavy Checks, and greater revenue opportunities with the higher productivity of E-Jets. There are many avenues for regional connectivity in India to flourish, and this should include building on the existing air links at existing airports where new routes can be developed or route frequencies can be increased. We believe that this opportunity is real and that this will drive the profitable growth of the industry and the economy in India. It is important to remember however, that to harness this opportunity, the right tools will be needed. In our case, we see that as being through the world’s leading 70 to 130 seat aircraft, the E-Jet family.